iGEM team students at the 2017 iGEM Giant Jamboree competition in Boston (photo courtesy of Twitter). 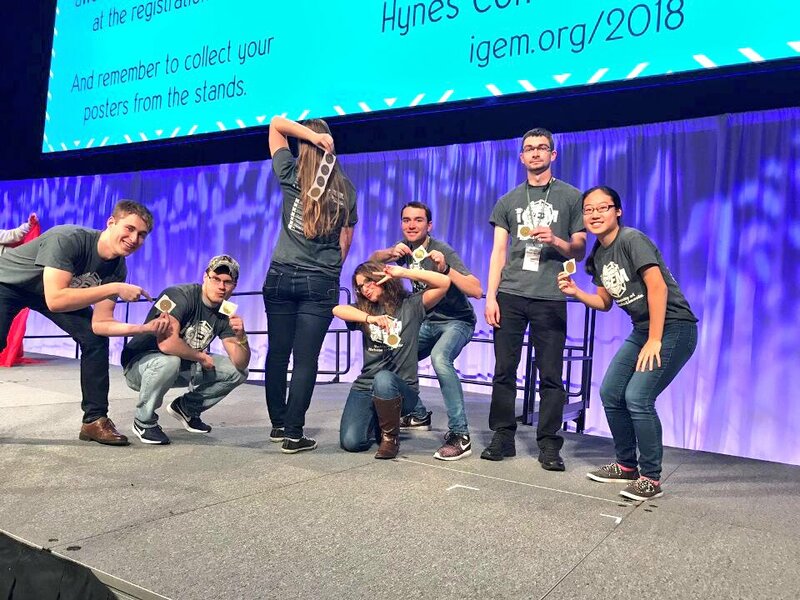 The University of Nebraska–Lincoln's iGEM team took home a gold medal and a safety award at the International iGEM Competition this past weekend. The interdisciplinary team's project involved reducing Nebraska’s methane emissions by genetically engineering E. coli and testing it in ruminal fluid. This is the second time the university (and CSE) has sent a team to compete in the iGEM Giant Jamboree in Boston. Last year's team took home a silver medal. Team members included students CSE students Tyler Barker, Colton Harper, and Logan Uhlir, along with fellow Nebraska students Danny Dooling, Nicholas Flaxbeard, Erome Hankore, Jessica Harms, Nic Kite, Alexis Krepps, Jaroslaw Pankowski, and Crystal Xu. Faculty advisers are Jiantao Guo, Cheryl Immenthun, Wei Niu, and CSE faculty Myra Cohen and Massimiliano Pierobon. Congratulations to our winners! View the full team and learn more about the project on the iGEM website.